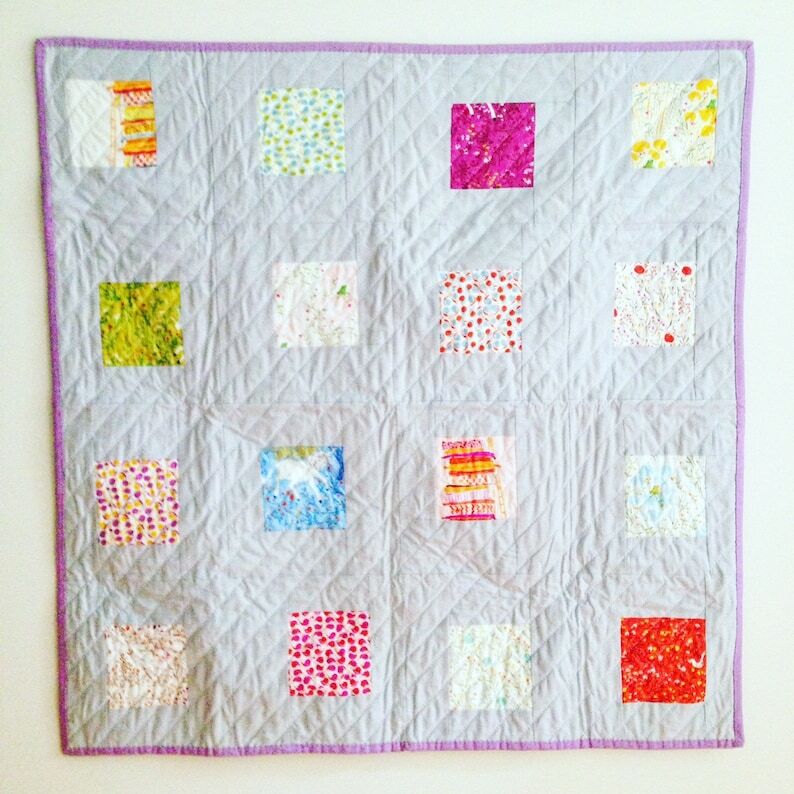 This handmade baby quilt features fabric from designer Heather Ross's Far Far Away collection. The blocks include various colors - purple, green, yellow, orange and blue, and are bordered by a medium gray color. The blocks are not aligned evenly and instead have slight variations in the spacing to create a more interesting look. The back is the same solid gray as the front, and the quilt includes a solid purple binding. It is made with quality quilting fabric, is hand quilted, and measures approximately 37" x 37". This quilt comes from a pet and smoke free environment. To care for this quilt, wash in cold water on gentle cycle and tumble dry on low heat. For more information, visit Brooklyn Quilting Co. at www.brooklynquiltingco.com, or at www.facebook.com/BrooklynQuiltingCo and http://instagram.com/brooklynquiltingco. Love this pattern! Easy to read! 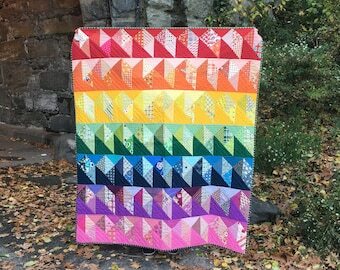 great pattern can't wait to make this!! You may purchase using a credit card or an ETSY gift card. A security deposit or pre-payment may be required for cost of materials on a custom order. Security deposits are non-refundable. I do my best to accurately represent my products and I want you to be completely satisfied with your purchase! Any unused and unwashed items can be returned within 7 days for a full refund minus shipping and/or any processing fees. You can return the item using your preferred method. However, please make sure to use a shipping method that can be tracked to avoid lost merchandise. Brooklyn Quilting Co. is not responsible and will not refund merchandise lost or damaged during transit. Your refund will be processed once the item has been received. Refunds cannot be provided on custom orders. Shipping fees are listed for each item. Your order will ship 1-2 following business days from the time of purchase via USPS Priority Mail/Flat Rate Boxes. Your order will be insured. You will receive confirmation and tracking information once your shipment is shipped. All communication is done via Etsy and/or email. I do offer combined shipping if you are interested in mulitple items. Please feel free to contact me with any questions.